More photos and commentary on this anon, however, because in about five minutes I have to leave for the hospital and the minor surgery to re-implant my chest port. I expect to be home before noon, lucid and ambulatory. Another step on the slide down into chemo hell. This work by Emily Siskin is licensed under a Creative Commons Attribution-Noncommercial-Share Alike 3.0 United States License. Love the hair, and loved the series of pics on Twitter. I'm hoping for better days for you on the other side of this madness. Dood, if I was that cancer I'd be leaving already! Whoa! Best of luck to you, dearie. We're all pulling for ya! Love the hair! Thinking of you. 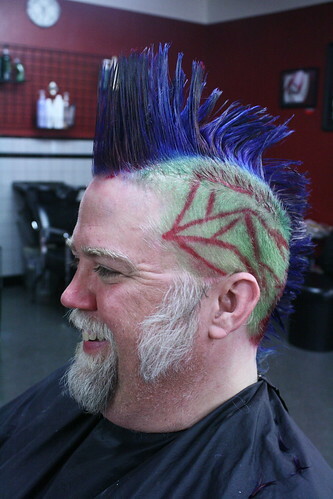 Subject: The Mohawk of DOOOOOOOM! At this point the cancer will be so intimidated that it will quail and fold completely at the first sniff of the chemo drugs. And then you will have this dream that's so amazingly vivid, weird and wonderful that you will have the plot for your next novel series, and it will stay with you and grow during this rough period. You are awesome, and put Chuck Norris to shame. Hang in there. Hah! Love the hair, though certainly not the reason behind it. Let us know where we can send knitted thingies if/when they're needed later on. Not that you should make a habit of, like, cutting off all your hair, but that's a great photo. May your day be less Ugh than you're dreading. You have the power of many lights behind you. Seems like the appropriate hair cut for battling those rogue cells in your body. Ditto on loving the hair but not the reason for it. You are indeed ready to do battle. In my head an 80s power pop soundtrack is starting up... but I realize I don't even know if you like that sort of thing. Wow - whatta nice shot. Your camera rocks. And take care, and best wishes. Love that color blue, but what the heck is the red? Did they use a magic marker?